Today we will resume our discussion about Folk Music in Lebanon with our host Father Dr. Badih el-Hajj whom we thank for his hospitality. Mr Kamal and yourself are most welcome. These episodes enrich our listeners’ knowledge and give them an insight into the cultures and heritage of the Arab peoples, notably in Lebanon. Let us discuss a beautiful style I came across in Baalbeck where someone from the Ṣulaḥ family sang it to me in the “Bayt al-Ṣulaḥ” quarter –which they insist on pronouncing “Bayt al-Ṣolaḥ” to differentiate themselves from the Ṣolḥ family in Beirut. This region is known for its purely authentic Baalbeck singing and dabka (modern Levantine Arab folk circle dance of possible Canaanite or Phoenician origin, performed in Lebanon, Jordan, Iraq, Syria, Palestine, Hatay, and Northern Saudi Arabia). They are the ones who taught Lebanese dabka to most dabka professionals. Muḥammad al-Ṣulaḥ recorded it… And I also heard it sung by ‘Alī Ḥlayḥil. The recordings illustrate the heartiness, pride, and honour expressing the victory in the battle. This song can’t be considered as non-Lebanese because it is from a region in Lebanon. Yet, as a result of zoning, those living in the mountains do not know it while the inhabitants of Baalbeck do and are proud it originated in Baalbeck. At the end of the day, Baalbeck is in Lebanon and the Lebanese people must know their heritage. Your podcasts contribute in informing them about all the styles present in the various regions in Lebanon. This song is to the sikāh. In fact, the statistics study I conducted relatively to the singing styles in Lebanon showed that most are to the maqām sikāh. In Lebanese ditties or nursery rhymes, and wedding songs, the sikāh is the most widespread, followed by the bayyātī. I will repeat the remark I made in the episode dedicated to tawshīḥ (improvised responsorial parareligious vocal form to a binary rhythm): to Sheikhs or to those who recite either Islamic or Christian religious inshād (religious chanting), the sikāh is a second-rate maqām (modal key) used in popular, not mundane, singing. Can we talk about this? Maybe because it conveys ṭarab (aesthetic emotion –felt by the audience– triggered by music and singing). It is a joyful maqām. Note that musical instruments were forbidden in both Islamic and Christian religious practices. They remain forbidden in Islam until today. Thus ṭarab was not supposed to be conveyed/reached. The sikāh includes some ṭarab because the non-fixed step conveys ṭarab more than the rāst whose meaning is intrinsic. Our example is “Yā marḥabā”: Muḥammad al-Ṣulaḥ says “Yā marḥabā ṭallū min el-jirdayn sumr el-liḥā”, whereas ‘Alī Ḥlayḥil says “Yā mīt halā ṭallū”. The words differ but the melody and the poetry structure are the same. At a certain point, we can hear “Mbarshmīna el-khēl”: In Baalbeck Bedouin dialect, “Mbarshmīn” means “they ornamented”. So, for our listeners, the sentence means “the horses are adorned” which implies that they won the battle. So “mbarshmīn” does not mean “they took barshām”. What does “taking barshām” mean? It means “they smoked ḥashīsh”. Shall we discuss another form? The following type, the dal‘ōna, is widespread in Lebanon, Palestine, and Syria. Furthermore, it stayed alive thanks to its simple structure, and also because it is the singing style that usually accompanies the Lebanese dabka and the Syrian dabka –knowing that the dabka is the folkloric dance present in all these countries. 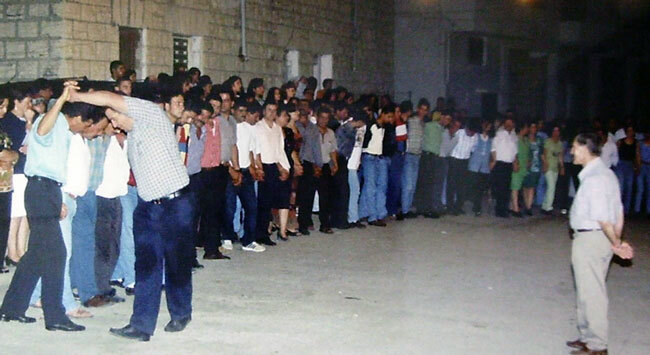 The Lebanese dabka distinguished itself as compared to the rest after the 1950 Baalbeck festival that resulted in rules and studies regarding this dance type. Also note that it underwent some fusion with Russian or Belarusian dancing, as well as with other types, until it developed and became the modern dabka. 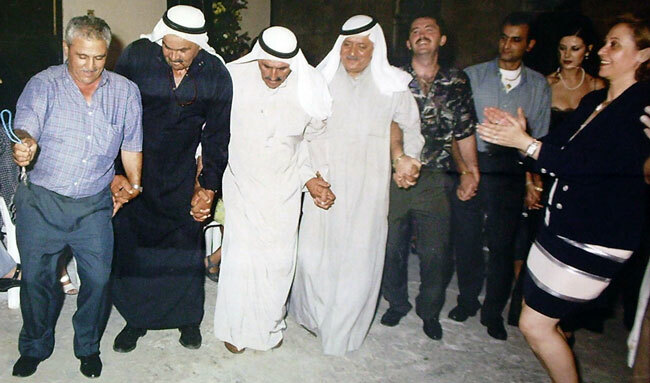 The dabka in Lebanon, Syria, and Palestine still accompanies all –mainly– happy events. according to Zakī Nāṣīf’s theories and TV or Radio episodes, the origin of the term is “al-‘awneh” (help. assistance): In the Lebanese mountains, people used to help/assist each other to build a house, to gather wheat, to cook kishk (dairy product made from drained yogurt or drained sour milk), to make jams, or to bake bread. The rooftops made from sand had to be rolled yearly at the end of the autumn just before winter came in order to keep water from entering the houses. When there was no stone maḥdala (roller), the young men used to do the rolling with their feet, spraying water and walking together in unison… According to Zakī Naṣīf, this is where the dabka came from, while the term dal‘ōna came from “Yallā ‘a-l-‘awnneh, yallā ‘a-l-‘awneh, yallā ‘a-l-‘awneh”. There are various types of dal‘ōna including the: North’s dal‘ōna, Baalbeck dal‘ōna, South’s dal‘ōna. The singing styles are close… maybe not all of them as there may be some I do not know. Still, most melodic styles are to the maqām bayyātī or jins (set of notes) bayyātī. For example … (♩)… where the styles remain close. A type recorded in Antelias, in Dhour Choueir were the Rahbani brothers were raised, or in the Metn, is not necessarily THE dal‘ōna. 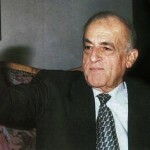 The dal‘ōna in Akkar, or in the Bekaa, are not the dal‘ōna we sing. I hope people will listen to the various dal‘ōna samples I have added that illustrate the dal‘ōna in the South, in the North, in Akkar…etc. They are performed differently, such as in the second tune …(♩)… that includes a leap: D… A (in the case of a bayyātī). We can understand how and why it was formed from the following: This type of dal‘ōna accompanies the fast dabka they dance in the mountains, whereas the other one accompanies the slow dabka that requires a large number of dabbīk-s (dabka dancers), i.e. the whole village. Since the venue does not fit everybody, they need to dance rooted to the spot. So the feet do not go up and down… no one jumps in front of the rest …etc. They sing slowly …(♩)…. as there is no possibility for a fast performance. Shall we tackle another type? The ghuzayyil is a diminutive of ghazāl (deer). In Arab civilisations and especially in Arab poetry, a person courts another using words depicting the most valuable things in his eyes. To the Arabs, the ghazāl was a beautiful domesticated animal with a beautiful face and beautiful eyes. So, a man would court a girl by comparing her eyes to the ghazāl’s long and beautiful eyes. Thus, a lady singer would sing “Yā ghzayyil” to show her love to a man, and a male singer would use it to show his love to a woman. This folk song is thus used for ghazal (courting. love song/poetry) and also accompanies dabka and folk dancing in the different regions. Moreover, there were a lot of deer –the animal– in the Lebanese mountains before mass construction. There aren’t any today unfortunately. Nobody ever told me they had found a deer except in the zoo –and that was thus imported from abroad. There are some in Syria. I think we exported “Yā ghzayyil” abroad. Even Baidaphon in Egypt recorded “Yā ghzayyil yā bū l-hība”. Baidaphon’s emblem was a deer. Exactly. 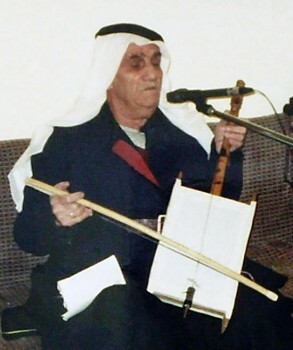 “Yā ghzayyil yā bū l-hība” was recorded a lot, including by Yūsuf Tāj. The Lebanese, including Yūsuf Tāj, exported it to America, and later to Syria, Iraq, and Egypt. Yet it originated in Lebanon. “Yā ghzayyil yā bū l-hība” means Abū el-haybeh. Knowing that the word “haybeh” is rarely used in other countries than Lebanon. We say in Lebanese “ ‘Ando haybeh”. “Bū l-hība” is the person with a beautiful presence. The presence is more important. “Hayba” (or haybeh) means composure, strength, and manhood. We have reached the end of today’s episode of “Durūb al-Nagham” presented with Father Dr. Badih al-Hajj. We will meet again in a new episode to resume our discussion about Folk Music in Lebanon.